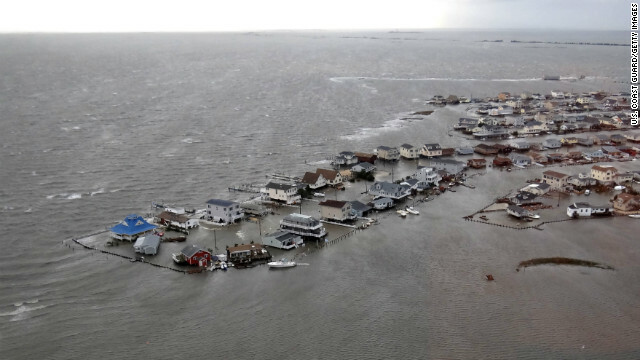 This photo from October 30 shows homes that were flooded by Superstorm Sandy in Tuckerton, New Jersey. After days of controversy surrounding the issue, the U.S. House has approved a bill that would send more than $50 billion in aid to states affected by last fall's Superstorm Sandy. Tuesday evening's vote came two weeks after the House approved a smaller, $9.7 billion package paying for flood insurance claims. It also comes following a controversy that arose because the House leadership did not put a Sandy aid package to vote in the final day of the last Congress. That delay came amid fiscal cliff bickering and consternation over dwindling federal funds. The bill that the House passed Tuesday will now go to the Senate. 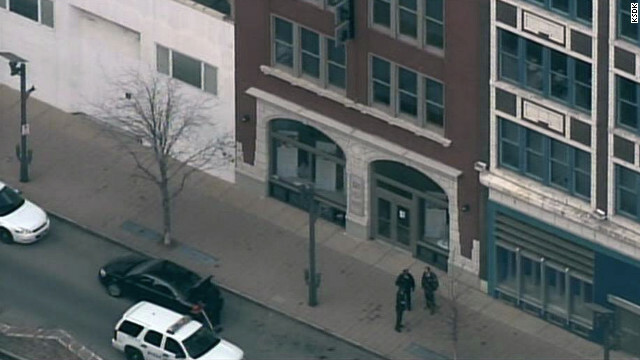 St. Louis police were called to Stevens Institute of Business and Arts following a shooting there Tuesday. [Updated at 5:38 p.m. ET] A part-time student at a business and arts college in St. Louis shot and wounded a school employee Tuesday before wounding himself at the institute, St. Louis police said. The suspect, who apparently shot himself, and the Stevens Institute of Business and Arts employee were taken to a hospital, where they were in surgery Tuesday afternoon, St. Louis Metropolitan Police Chief Sam Dotson said. Police officers responding to a 911 call found the employee, identified only as a man in his late 40s, wounded in the school in downtown St. Louis. Officers then found the wounded suspect in a stairwell, as well as a handgun that investigators believe was used in the shooting, Dotson said. Other students, faculty and staff members "headed for the doors" after the shooting and were taken to "an offsite location" to be interviewed by investigators, Dotson said. [Initial post, 3:59 p.m. ET] Two men have been taken to a hospital in critical condition after a shooting at a St. Louis business college Tuesday, St. Louis fire Capt. Dan Sutter said. A suspect was in custody after the shooting at Stevens Institute of Business and Arts, according to a St. Louis Metropolitan Police Department officer. No names or details about the injuries were immediately released. Check this page for updates. Read more from CNN affiliate KMOV and CNN affiliate KSDK. A New York gun bill includes a state gun registry, a uniform licensing standard and new limits on ammunition magazines. [Initial post, 5:09 p.m. ET] New York Gov. Andrew Cuomo has signed the nation's first new gun-control bill since last month's massacre at a Connecticut school. “I am proud to be a New Yorker because New York is doing something, because we are fighting back (against gun violence),” Cuomo told reporters shortly before signing the bill. The law, among other things, requires background checks for would-be purchasers on all private sales, fortifies the state's existing assault weapons ban, limits the number of bullets in magazines, and strengthen rules that keep the mentally ill from owning firearms. Read more about the bill here. Also, New York's move comes a day before U.S. President Barack Obama is to announce his own gun-control proposals for the country. [Initial post, 4:27 p.m. ET] Lawmakers in New York have passed the country's first new gun-control bill since last month's massacre at a Connecticut school. 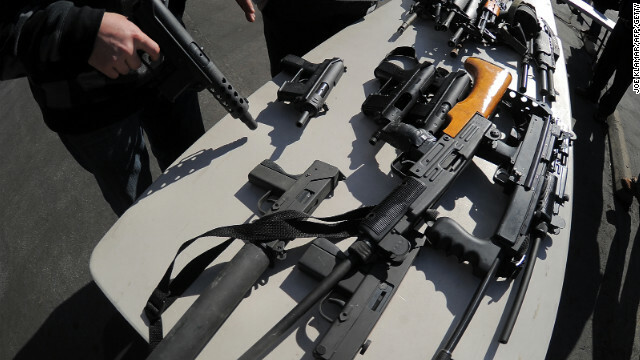 New York's Democratic-controlled Assembly approved a new set of gun regulations Tuesday intended to fortify the state's assault weapons ban. The measure was approved by the GOP-controlled Senate on Monday and is expected to be signed into law by Gov. Andrew Cuomo soon. [Initial post, 11:28 a.m. ET] The nation's first new gun-control bill since last month's massacre at a Connecticut school might be passed in New York today. The bill, intended to fortify New York's assault weapons ban, limit the number of bullets in ammunition magazines and strengthen laws that keep the mentally ill from firearms, is expected to be taken up by the state's Democratic-controlled Assembly early Tuesday afternoon. The GOP-controlled state Senate approved the measure in a 43-18 vote Monday night. Almost 350 members of the U.S. military committed or may have committed suicide last year, the Pentagon says. The number of U.S. service members who committed suicide last year might be a record. Despite extensive support and counseling programs, as many as 349 U.S. service members committed suicide last year, which would be the highest number since the Department of Defense began keeping detailed statistics in 2001. 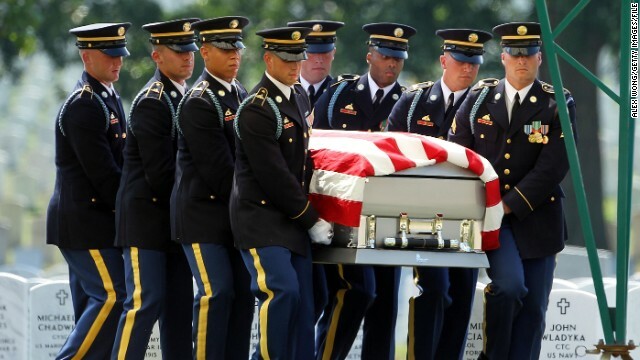 According to the Pentagon, 239 military deaths in 2012 have been confirmed as suicides and another 110 are being investigated as probable suicides. The number of suicides in 2011 reached 301. [Updated at 1:29 p.m. ET] Islamist rebels would have taken Mali's capital had France's military not intervened in the African nation in the last few days, French President Francois Hollande said Tuesday. "If we had not taken up our responsibility and if on Friday morning we had not acted with this intervention, where would Mali be today?" he asked. The French defense minister told CNN that up to 800 troops are in Mali to help Malian forces in an offensive against Islamist militants, and that up to 1,700 total French forces - including the 800 in Mali - are involved in a variety of capacities, such as offering logistical support from various French military bases across Africa. Hollande, speaking on a visit to the United Arab Emirates, said France intends to "make way as quickly as possible" for an African force. Read more about France's military intervention, which began Friday. 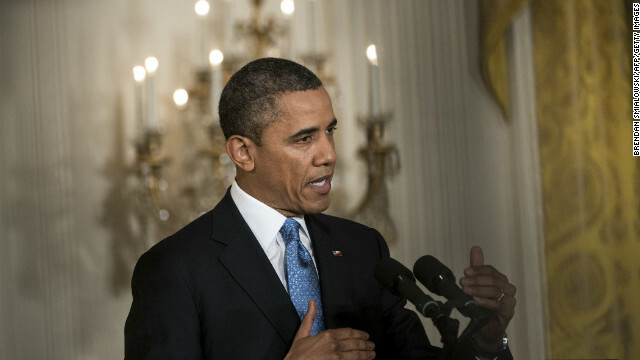 It didn't take long for U.S. President Barack Obama to decide how he wants to try to reduce gun violence. Obama (pictured) and Vice President Joe Biden will announce Obama's plan for reducing gun violence on Wednesday, the White House said Tuesday afternoon. Biden had given recommendations to Obama after leading a task force on the issue last week. Obama's proposal will be comprehensive, and will include legislative options for banning assault weapons as well as steps to address high-capacity magazines and federal background checks, White House spokesman Jay Carney said. Obama and Biden will be joined by children from around the country who wrote letters to the president, Carney said. What proposals do you want to see to reduce gun violence? Share them at CNN iReport, Facebook, Twitter, or in the comments below. A member of the board of Livestrong, the cancer foundation founded by Lance Armstrong, said Tuesday he felt betrayed by the doping controversy that has engulfed the cycling star but hopeful that Armstrong can emerge from it and do more good for cancer sufferers. "It's been devastating," Livestrong board member Mark McKinnon said on CNN's "Early Start." "But I'm glad Lance is coming forward," he told CNN's John Berman, referring to Armstrong's interview with Oprah Winfrey, in which he's said to have acknowledged using performance-enhancing drugs. McKinnon said an admission would be a good starting point for Armstrong to continue helping the foundation. “I think he’s got a lot of apologies, I think he’s got to crawl over a lot of broken glass … but the one thing they can’t take away from him is his cancer survivorship," McKinnon said. "That story gives great hope to millions of people," said McKinnon. "There’s a lot of good work he can continue to do there if he’s willing to sacrifice and make clear that he’s sacrificing for the cause, that he’s willing to serve a cause greater than himself." Livestrong bracelet: Wear it or not? A British Christian woman suffered religious discrimination when British Airways told her not to wear a visible cross over her uniform, a top European court ruled Tuesday. However, three other British Christians lost related religious discrimination claims at the European Court of Human Rights. [Updated at 9:34 a.m. ET] Sometimes news travels faster than an airplane. Media reports began swirling immediately after Lance Armstrong’s interview Monday with Oprah Winfrey that he admitted for the first time to using banned substances. Those details came despite an agreement between Armstrong’s camp and Winfrey that they would not leak any details of the interview, she told CBS on Tuesday. But it didn’t last for long. While Winfrey characterized the nature of the interview, she was not specific in the words Armstrong used or what specific admission he made. Winfrey said Armstrong "did not come clean in the manner that I expected." She said he "was ready" and "met the moment." "We were mesmerized and riveted by some of his answers," Winfrey said. The interview lasted two and a half hours and will air across two nights on her network, OWN, and will be streamed on her website, Oprah.com, she told CBS. The first part will air Thursday from 9 p.m. to 10:30 p.m. ET. You can watch Oprah's interview with CBS here. 10:00 am ET - House lawmakers read Constitution - Two years ago, House lawmakers from both sides of the aisle came together to read the U.S. Constitution aloud for the first time in the House chamber. Today, lawmakers will do so again. Train cars filled with Egyptian security force recruits hopped the tracks and crashed in Giza early Tuesday, killing at least 19 people and injuring some 107 others, a local official said. The train carrying Central Security conscripts was heading from Assiut north to Cairo when it partially derailed around 12:45 a.m. Tuesday (5:45 p.m. ET Monday) in Giza, National Railways Authority Chairman Hussain Zakaria said, according to state-run EGYNews. The partial derailment happened after two cars separated from the rest of the train, said Transportation Ministry spokesman Mohammed Shahat, according to the same news organization.